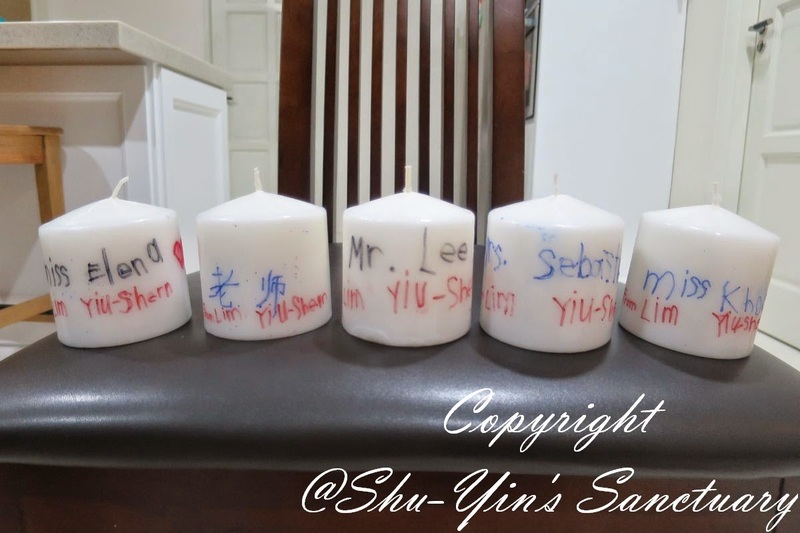 Shu-Yin's Sanctuary: Kid's Art & Craft: Personalized Decorated Candles for Teacher's Day! 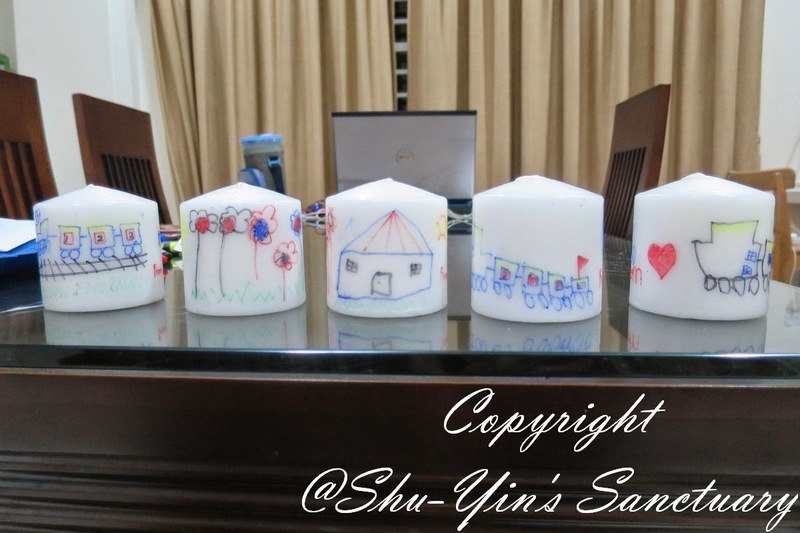 Kid's Art & Craft: Personalized Decorated Candles for Teacher's Day! 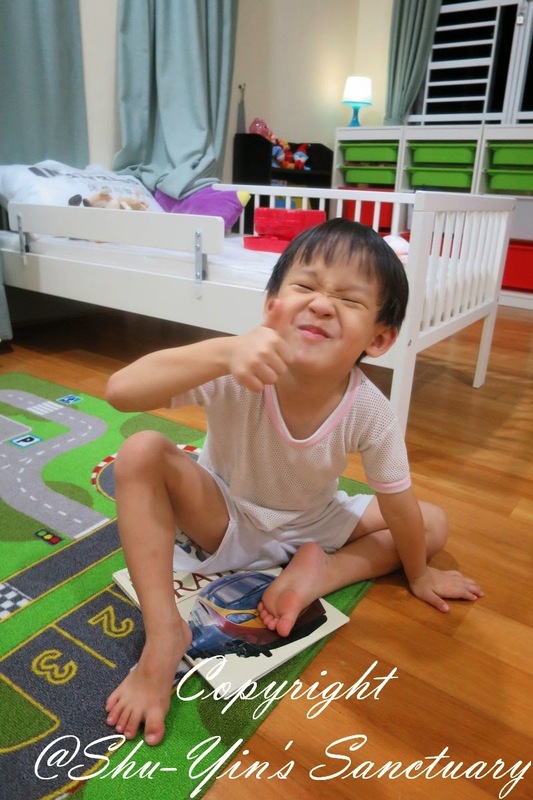 Shern came home from school earlier this week and told me that he wants to make something for his teachers for Teacher's Day. To tell the truth, I didn't even know when is Teacher's Day and I needed to ask Mr. Google. Found out that it is on Friday. So I had 4 more days to prepare. I went to my favourite Pinterest site for ideas, and I knew I wanted something easy and yet personal. And I wanted Shern to be part of it instead of just buying a gift for the teachers. And then I saw this brilliant pin on Pinterest - on how to make decorated candles. First of all, I asked Shern for how many he wanted to make. He started listing out all the teacher's name in his school, and I needed to limit him to only the teachers that teaches him. 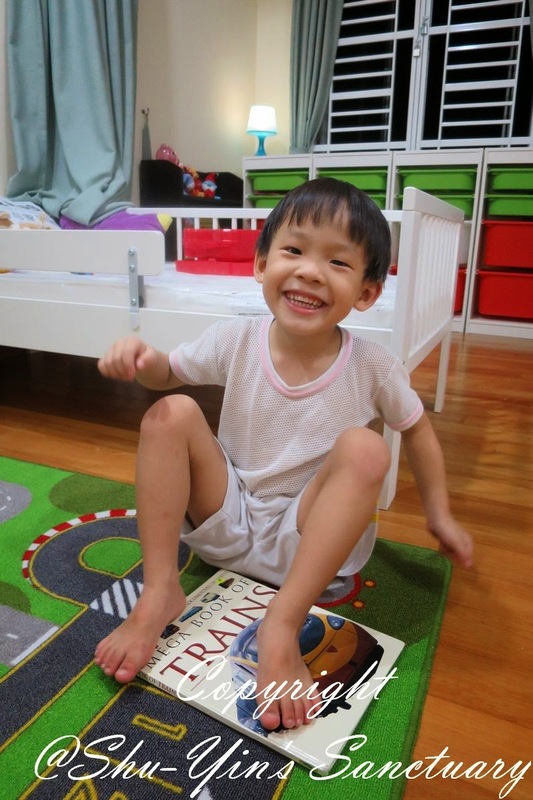 "But I like Miss Khoo, and she was my teacher last year." We narrowed down to 5 teachers. 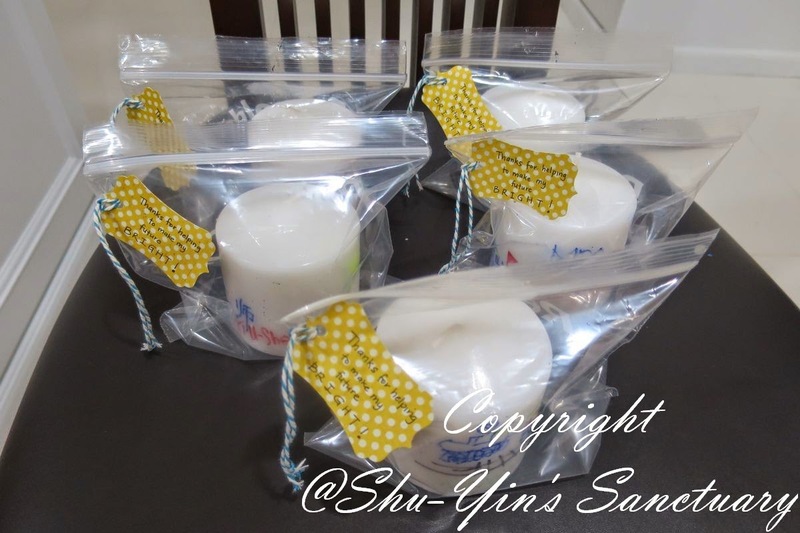 We went shopping on Wesak Day and I bought some white candles for RM5 each from Daiso. I figured Shern can make one or two each day and should be ready by Friday. 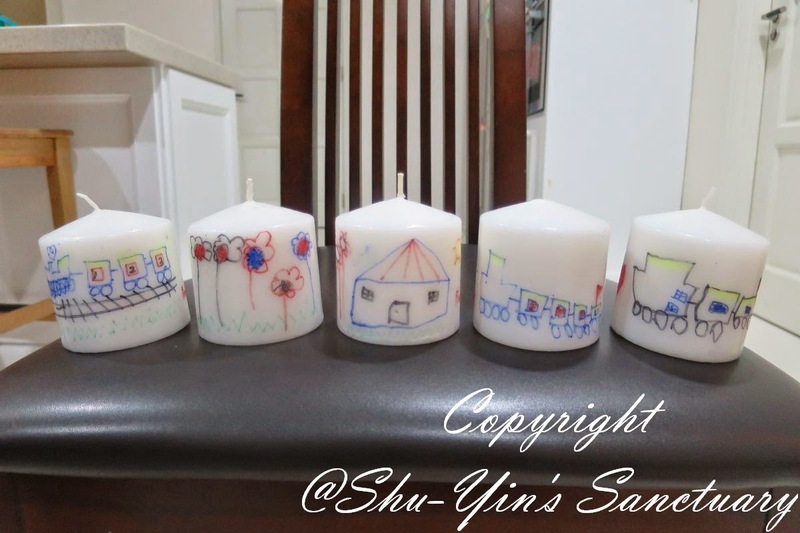 But when we got home, Shern was so excited that he wanted to draw and decorate the candles straightaway. I took out whatever markers we had - Sharpies, Stabilo, Magic Pens. And he started drawing on each candles. As you can see, he drew 3 train drawings (he loves trains), 1 with flowers for his 老师 and a house for his Science teacher. We found out that Stabilo works well, and magic markers don't write that well. As for Sharpies, colours are strong but you need to scribble on a piece of paper every now and then to make the ink 'flow', and to get out the wax on the pen nib. So this is the front where his drawings are. And this is the other side, where his teacher's names and his name. 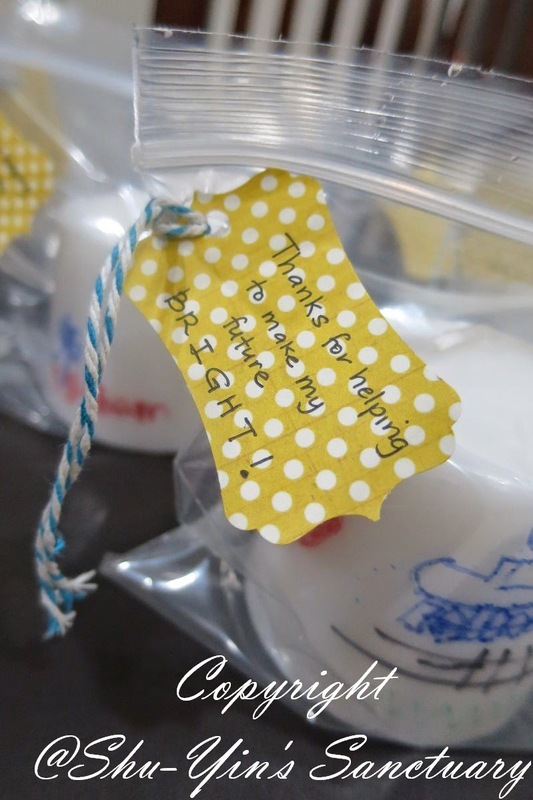 And then I punched some tags on a pattern paper and wrote 'Thanks for helping to make my future BRIGHT!' on them. And he finished all 5 on the night itself! You can try this out. 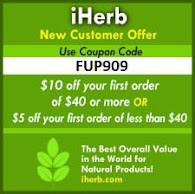 Is easy for kids to make, and is very personal and versatile too. You can even make this for other occasions such as Mother's Day, or even Valentine's Day! 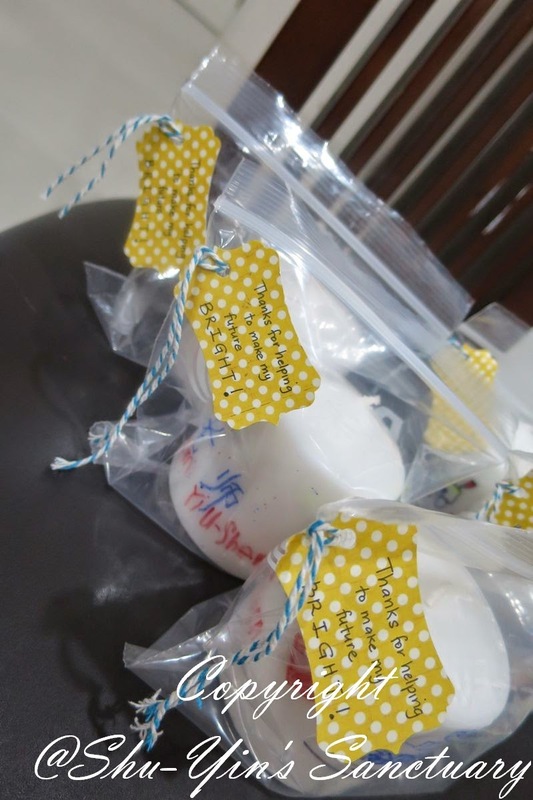 I'm sure everyone would love a personalized decorated scented candle! And Happy Teacher's Day tomorrow!